Images of Ebb (with Adnan Hadzi (Deptford TV) + Rob Canning (GOTO10)) will introduce participants to Sousveillance and CCTV filmmaking where material and images from the Deptford.TV archive will be edited to submissions from Sounds of Ebb. Footage taken from Deptford.TV was filmed during a previous TV hacking workshop where participants equipped with CCTV surveillance signal receivers were lead through the city by incoming surveillance camera signals. CCTV video signal receivers cached surveillance camera signals into public and private spaces and were made visible: surveillance became sousveillance. By making images visible which normally remain hidden, we gain access to the “surveillance from above” enabling us to use these images to create personal narratives of the city. The Images of Ebb Workshop will look at constructing a narrative to the Sounds of Ebb. 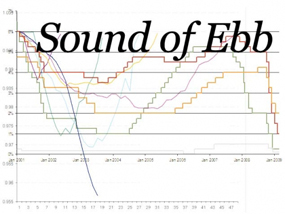 Sound of Ebb (a branch project of The End of Something) is an open source sound series that asks sound artists and artists working with sound to respond to the question: What is the sound of Recession? Contributions are collected internationally reflecting the affects of crisis and recession from various social contexts and geographic locations. Together the Sounds of Ebb and images from Sousveillance produce articulations of a local city in crisis with global resonances of recession. Deptford.TV is a research project on collaborative film – initiated by Adnan Hadzi in collaboration with the Deckspace media lab, Bitnik media collective, Boundless project, Liquid Culture initiative, and Goldsmiths College. It is an online media database documenting the urban change of Deptford, in Sout East London. Deptford TV functions as an open, collaborative platform that allows artists, filmmakers and people living and working around Deptford to store, share, re-edit and redistribute the documentation of Deptford. GOTO10 is a collective of international artists and programmers, dedicated to Free/Libre/Open Source Software (FLOSS) and digital arts. GOTO10 aims to support and grow digital art projects and tools for artistic creation, located on the blurry line between software programming and art. The End of Something is a critical archival project that aims create a platform for reflection on the global crisis. During August 2009, LOUDSPKR in collaboration with Volume will embark on an on-going process of accumulation to build up an archive of personal, critical and creative reflections from a local and international community. Located in the former “Archive Room” of a police station, Volume will become once again a bureau and repository for information. The archive exists both online in a ‘digital archive’ and in a physical archive at Volume. As a provisional space, the archive is perpetually incomplete and flawed. It, however, offers a space for dialogue and critical reflection on notions of crises that demand urgency as it increasingly seeps into our everyday. Through events, workshops and talks, the public will be engaged in processes of creating and imagining new narratives and understandings of a rather complex time.